Personal finance topics including budgeting, debt reduction, investing, income creation and saving. As you look forward to another year, you're probably thinking of some goals you'd like to accomplish. Even if you don't set formal New Year's resolutions, chances are that you probably have some expectations for the coming year, and some things that you'd like to make happen. If you still have high-interest consumer debt, now is probably a good time to tackle that. The current situation with the economy is likely to change, and when that happens, you might find yourself paying more in interest than you would like after this year. Since before the financial crisis, the Federal Reserve has been taking steps to keep interest rates low. After the financial crash, and after the Fed cuts rates as far as they could go, they took it a step farther and actually started adding to the monetary supply. All of this has meant super-low interest rates. For savers, it's been something of a nightmare. For those with debt, though, the relatively low rates mean that more of their payments are going toward reducing the principal on their debt. Now, though, the Fed has begun to taper its asset purchase program. The economy is picking up, and that means that interest rates are likely to rise. Debt is probably going to cost more by the end of 2014, and that means that it's probably time to act now. 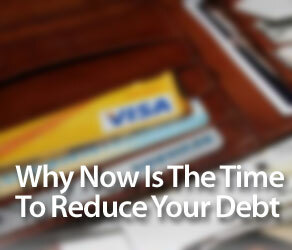 If you still have credit card debt or other high-interest consumer debt, now is the time to kick up your repayment. Call your creditors and see if you can get a bit of an interest rate reduction. If balance transfers are options, make use of them so that you can lock in lower rates. Take a day to work out a plan that can help you improve your finances and help you reduce your debt. It's also a good time to lock in lower rates. At some point in the relatively near future, rates on 10-year Treasury notes are going to rise. Mortgage rates are tied to these yields, so that means mortgage rates are likely to rise. They're already higher as compared the rate I got when I refinanced my house in early 2013. They are only likely to go up as the economy improves. Car loans are also offering good deals right now. If you normally finance your cars (I know, I know, a cardinal sin), locking in now can make sense. Refinance your car or home, and you can save on your monthly payment and save on your overall interest. Do You Have To Pay Off ALL Debt? The good news is that you don't have to pay off all of your debt right now. I'm not fussed about paying off my mortgage early, and I am comfortable with my current car loan payment. I'm also in no hurry to pay off my student loans. Why? Because all of these loans are locked in at very low rates. My mortgage rate is low, my car loan and my student loans are below 2%. My investment returns are higher than what I pay in interest on these low-interest loans, and the interest on the mortgage and student loans is tax-deductible. Consider your situation, and what makes sense for you. If you have high-interest consumer debt, think about speeding up your pay off schedule. In the past, I've made big lists of New Year's resolutions, only to give up on most of them within a couple of months. Having several money goals to focus on is a bit much, and you can easily become overwhelmed as you try to multi-task your money goals for the coming year. 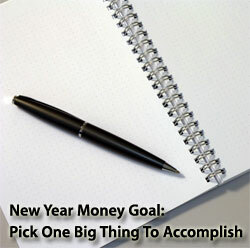 Instead of making a list of several money goals, try picking one big thing to accomplish during the year. The great thing about this approach is that you have one over-arching goal that can be broken down into manageable steps. What's the Most Important Financial Thing You Can Accomplish This Year? Your first step is to consider your priorities. What's the most important thing you can do with your money this year? What do you most want to accomplish? Perhaps you want to pay down debt. Maybe you want to work toward maxing out your retirement account contributions. Maybe you want to save up for a down payment on a house. This year, I want to boost my income investing efforts. I haven't done much with dividend stocks and other income investments, and I want to try and remedy that problem. That's my big goal for the year. Once you figure out the most important thing your money can do this year, it's time to make a plan. First of all, it's important that you realize that focusing on one aspect of your finances for the year is not an excuse to neglect what you're already doing with your money. If you automatically set aside $200 a month in an IRA for your retirement, don't change that just because your focus is saving up for a down payment. If you already have solid money practices in place, keep with them. Use your financial resolution as a way to take one area to the next level, not as an excuse to drop all the good things you're already doing. Thinking of your big goal, acknowledge what you need to do in order to make it happen. What steps do you need to take to achieve your big goal. The great thing about choosing one thing to work on is that you have the entire year to work toward your accomplishment. Let's say you want to work up to the point where you can max out your IRA. For 2014, you can contribute up to $5,500 for the year. This comes to $458.33 a month. If you already contribute $200 a month, this means you need get to the point where you're contributing another $258.33 each month. Chances are that you can't just add that much each month immediately. You need to work up to it. Perhaps you think you can free up $58.33 immediately. Go ahead and start contributing that, and then start seeing where you can find more money. Whether it's cutting back on things you don't need, or whether it's earning more money, you can gradually make the changes in your life that lead to the point where, by the end of the year, you are contributing $458.33 each month to your IRA. It's small steps throughout the year, but you'll reach your goal — and it will be easier to max out your IRA each year going forward. If the contribution limit is raised, you'll more easily be able to add a little bit more each month, since you can break it down. This process works with other money goals as well. Breaking it down and focusing on one objective can help you get your finances in order and make significant progress. The information contained in SmartOnMoney.com is for general information or entertainment purposes only and does not constitute professional financial advice. Please contact an independent financial professional for advice regarding your specific situation. Dave Ramsey’s 7 Baby Steps: Step 7 – Build Wealth And Give!